I can’t wait to try Hampton Creek! I’ve heard great things (from you and Megan Rascal) and last night I met a woman who said it has the perfect amount of tang. Just like you said! ALRIGHT IT’S OFFICIAL, I GOTTA TRY IT. Did you ever have the Badass Breakfast sandwich from Locali? They put chipotle mayo on it, and I was not sure it was my bag either, but it turns out it is! on December 29, 2013 at 1:38 pm | Reply Sarah E.
Hey thanks Jenny! 🙂 I’d love to know what a gourmand such as yourself thinks of it! And perhaps we can eat sammiches together sometime! I’m excited to try this stuff, but I keep wondering how it could possibly be better than Vegenaise! I eat that stuff with a spoon from the jar (don’t judge!). But everyone says Hampton Creek has nailed it. So….I can’t wait to try! Heard about these fantastic products via Our Hen House, and have been hankering to get my paws on that cookie dough ever since. Thanks for a great review, Sarah! Also, is this your favorite GF bread? I’m trying to find a good brand but am nervous about the trial and error process. If you could recommend one to me, that would be great! on January 6, 2014 at 2:24 pm | Reply Sarah E.
one of the ingredients is “modified food starch”. is that good for your body? 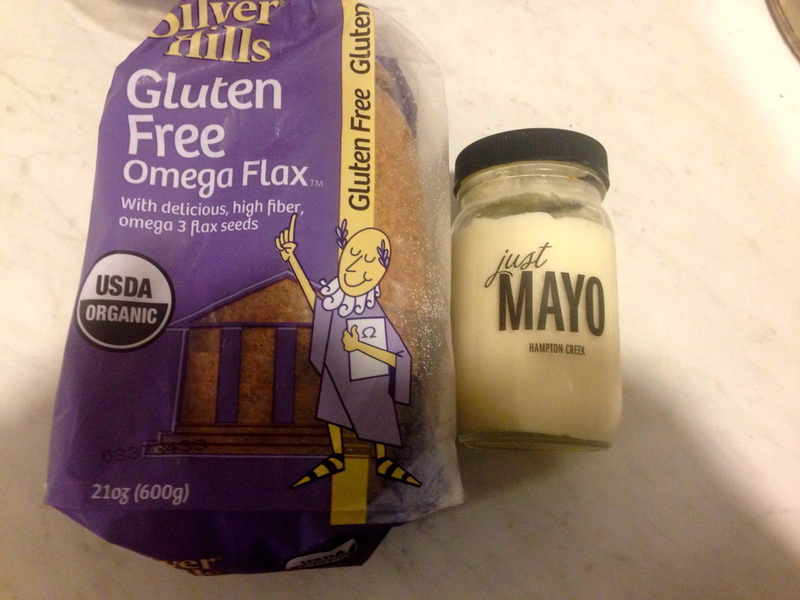 on April 21, 2014 at 10:19 pm | Reply Sarah E.
It’s mayonnaise! Not exactly, um, green juice. That being said, I’m not sure whether modified food starch is unhealthful or not. For sure way better than animal products, though!